From this definition, we can infer some basic characteristics of projects, such as they are finite in duration, they are unique, they have defined deliverables, they bring about change, and that they consume resources. Given this definition of a project it’s a little easier to answer our “what is project management?” question. Project management can be defined as the processes, techniques, and skills to achieve the objectives of the project. The aim of project management is to predictably deliver the agreed deliverables (the scope) to schedule, on budget, and to the agreed quality level. All of these components of the project combined define the scope of the project. 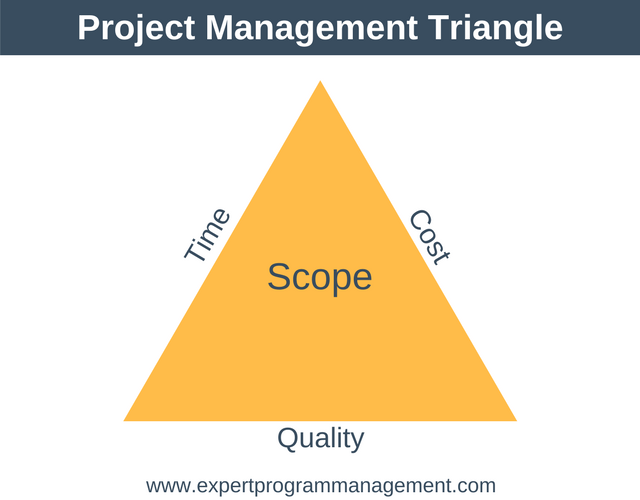 This diagram is know as the project management triangle, or sometimes the triple constraint or iron triangle diagram. What it is showing us is twofold. First, it shows us that the scope must be specified in terms of project schedule, quality level required, and budget available to complete the work. But second, it shows us that if a major problem occurs and we can no longer complete the project as planned, then we must compromise on timeframe, budget, or quality level. If we are not able to compromise on these three values then the only option left is to compromise on the scope itself. It should be obvious that delivering complex projects which deliver unique things that have never been undertaken before can go wrong. This is why the word “predictable” is important. We’re trying to manage delivery in a predictable way to an agreed scope. When things go wrong, which is natural and sometimes unavoidable, we must agree to a scope change if we’re going to continue to deliver the project predictably. This could mean increasing the time available to deliver the project or it could mean reducing the deliverables, for example. To be a successful project manager you need to be proactively continually driving progress, along with possessing a blend of project management skills, people management skills, and business acumen. Ensure you understand why the project is being done, and what the project will produce. Plan the project, to understand how long it will take and cost. Manage the project to ensure it meets its scope (deliverables, budget, timescale, and quality). Close the project once everything delivered by the project is of the required quality. These four steps are summarized in the diagram below. These four steps are pretty much the simplest project life cycle you have have. There are others of course, which you can learn about here. To answer the question, “what is project management?”, we’ve defined what a project is and then defined project management as the tools, techniques, and processes needed to meet the objectives of the project. We’ve also shown a very simple four step process to manage any project. 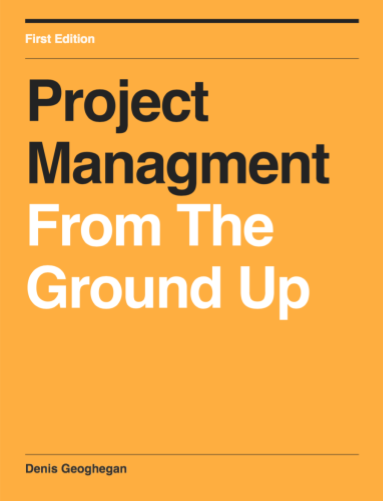 To dive deeper into the what is project management question, take a look at our project management guide.